Smith, who has been banned from the game for a year, had already been removed from the brand's website. 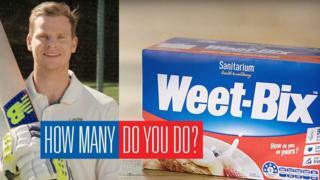 Weet-bix owner Sanitarium said the cheating went against "brand values of trust and integrity". While the value of the three year deal was never announced, Magellan's decision to end the contract after less than eight months will cost the sport a reported 20 million Australian dollars (£10.9m; $15.3m). Also on Thursday, Commonwealth Bank said it was ending Steve Smith's role as a sporting ambassador. Smith, 28, was named as a so-called 'Weet-bix Kid' in late 2015 alongside other Australian sports stars including footballer Tim Cahill and surfer Stephanie Gilmore - and was central to the cereal's marketing campaigns. "Weet-Bix ambassadors represent our brand values of trust and integrity, and they speak to everything that is good about being Australian," said Todd Saunders, executive general manager for Sanitarium Australia. "Their role as a 'Weet-Bix Kid' is to inspire millions of Aussie kids to be the best they can be. Based on the ball tampering incident and the findings of Cricket Australia's investigation, we are unable to continue our relationship with Steve Smith." Magellan's chief executive Hamish Douglass said the ball-tampering in South Africa was "so inconsistent with our values that we are left with no option but to terminate our ongoing partnership with Cricket Australia". "A conspiracy by the leadership of the Australian Men's test cricket team which broke the rules with a clear intention to a gain an unfair advantage... goes to the heart of integrity." In a statement, Commonwealth Bank said that "While appreciating the work Steve Smith has done in partnership with us to support cricket for all Australians, in light of recent circumstances we have concluded our current arrangement with Steve as a sporting ambassador". It added it would continue to sponsor "women's cricket, Indigenous cricket, cricketers with disabilities and grassroots cricket across the country." Airline Qantas, whose logo appears on the Australia team's shirts earlier said it was "very disappointed" by the scandal but has so far revealed no plans to pull its sponsorship. But although they remain eligible for competition outside of Australia, Smith and Warner were also banned from this season's Indian Premier League. In January the pair were signed to the most lucrative Twenty20 contracts ever offered to an Australian player - reportedly worth over £1m each.